Front gardens often get neglected and dismissed when it comes to plants. But a small area can still look great if planted well. Choosing low maintenance, slow growing evergreens is one way of providing texture and colour all year round. 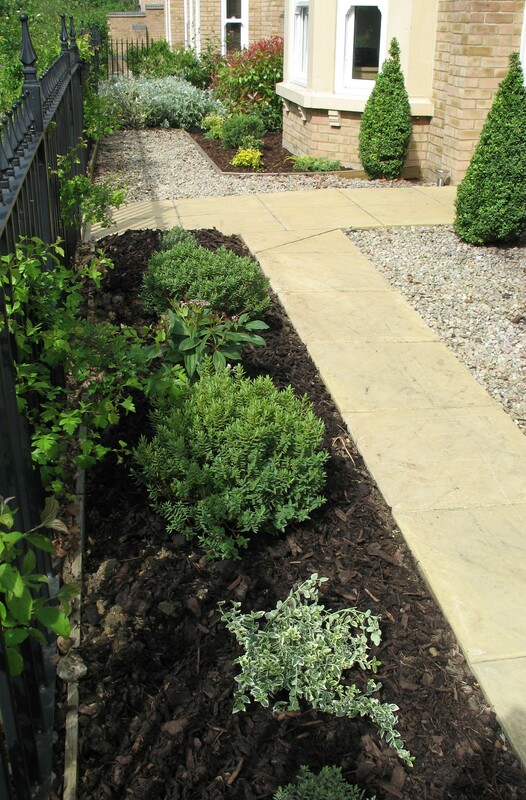 This courtyard front garden worked well keeping the planting simple with interesting foliage. Euonymus are perfect for ground cover and tough plants that will survive almost anywhere! Two of my favourites that I used here were ‘Emerald Gaiety’ and ‘Emerald ‘n’ Gold’. An evergreen Hebe that makes a good addtion to this type of planting is ‘White Gem’. It’s a compact busy shrub with glossy leaves and produces a mass of white flowers in the summer. Pittosporum are superb evergreen plants that have beautiful wavy leaves. The variety ‘Gold Star’ was used here for it’s colourful yellow new growth that turns variegated as the year goes on. Finally a plant that I like to use for it’s architectural dome like shape in the border is Viburnum davidii. It’s another ‘tough’ plant with magnificent leathery leaves. Buy a male and female plant if you can and you will be rewarded with metallic blue-black berries in winter.